Hans Scheugl: You used real recordings that you drew on. Kurt Kren: There was already a rumour that Venice would come to an end one day. And then there was an American battleship in the background. I had fun destroying the image. Hans Scheugl: They say you were drunk when you filmed Grün - rot. Is that right? Kren: I'm not sure if it was that film or not. Grün - rot was not filmed in one day, but in the course of many days. It wasn't that easy. The whole thing was filmed in single frames while I was moving up and down. It was physically very exhausting to make this film. The lighting changes from artificial light to sunlight, which causes a change in the colours. 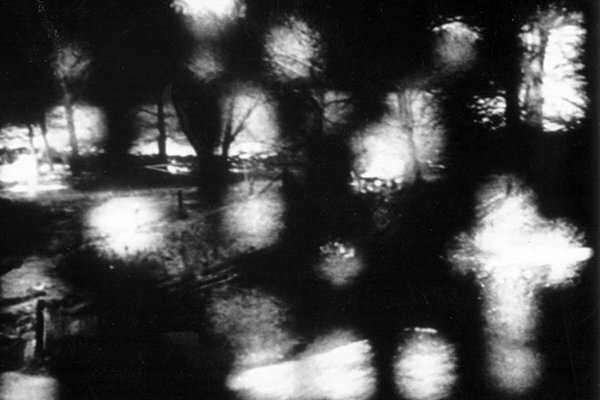 In thousandyearsofcinema Kurt Kren turns his perspective around with a quiet and unsettling irony. The images appear. One eye tightly shut and the other pressed against the viewfinder. This is the standard position which Kren captures in single frames. Uncountable photographers, with their acutely-angled cameras directed at St. Stephan's Cathedral whizz by. Picture after picture is about to be exposed in a form of collective unanimity. Nicky Hamlyn is a writer and filmmaker based in the United Kingdom. He teaches at the University for the Creative Arts and the Royal College of Art in London and is the author of Film Art Phenomena. Simon Payne is a filmmaker, writer and programmer. He is Senior Lecturer in Film and Media studies at Anglia Ruskin University, Cambridge. A. L. Rees (1949–2014) was a critic, historian, and research tutor at the Royal College of Art, London. Kurt Kren: Structural Films will be available at a special discount price. This programme is kindly supported by the Department of English and Media at Anglia Ruskin University and the Austrian Cultural Forum.